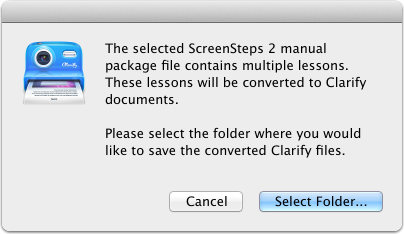 Clarify can convert ScreenSteps 2 manual and lesson package files into Clarify documents. You can export package files from ScreenSteps 2. If you are importing a ScreenSteps 2 manual package be aware that Clarify will only convert the lessons in the package file. Clarify doesn't have a concept of manuals or chapters so that information will be discarded. 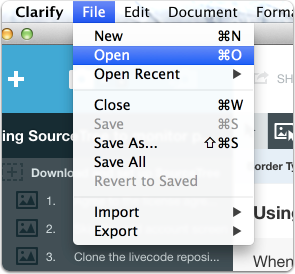 You can use the File > Open menu to open a ScreenSteps 2 manual package file. 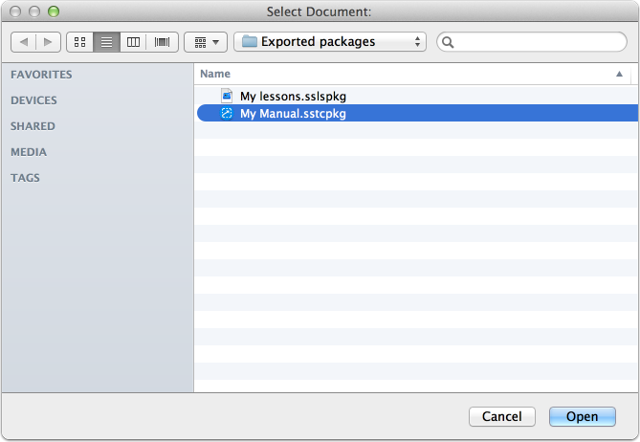 If the package you are opening only contains 1 ScreenSteps lesson then that lesson will be opened in a Clarify document. If the package contains more than 1 ScreenSteps lesson then you will be prompted for a folder to store the converted files in. After the conversion is complete you can then open the converted documents in Clarify. I just upgraded from ScreenSteps 2 to Clarify 2. I don't have a files with those extensions. Instead I have a folder that contains a Lessons folder and a Library.data file. Inside the Lessons folder are my numbered folders and inside them are Data and Media folders containing png files. How do I import these lessons? @Dave From within ScreenSteps 2 you can export a manual or lesson as a Package. The package file is what you would then import into Clarify 2. I have two Screen steps packages which I want to merge into clarify. How can I do that? @Roger If they are ScreenStep 2 packages then you would import each one independently as separate Clarify files. You would then select all of the content in one file (use the left column for this), copy, and then paste the content at the end of the other Clarify document. What's the difference between .sstcpkg files as above and the scstpkg files ScreenSteps desktop and web actually seems to generate now? I seem to be missing something as I can't import anything. @Simon - Clarify cannot import ScreenSteps 3 package files. It only supports ScreenSteps 2 package files. That's a shame - is there any other solution? We have hundreds of pages of lab manuals I was hoping to transfer. @Simon - there is not. Your only option are the export options provided within the ScreenSteps 3 desktop software (HTML, PDF, Word).